One of my favourite things about Valentine’s Day is the excuse to eat even more candy than I normally do. If the candy is a gift it would be rude to turn it down, right? Yep, that’s what I thought. 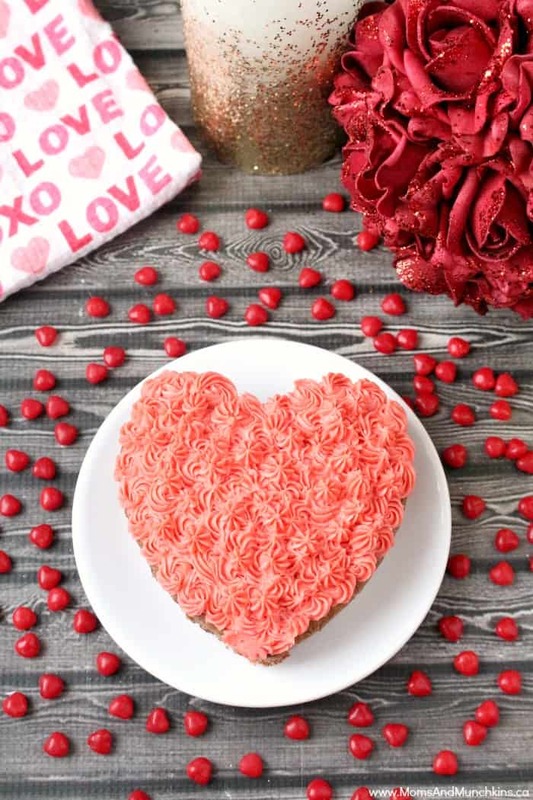 If you’re looking to make a sweet treat for a special someone, I have a delicious idea for you – Cinnamon Heart Cake with Cinnamon Buttercream! This is super easy to make and it starts with a simple boxed cake mix. With a busy child at home, I’m all about baking shortcuts. Why make a cake from scratch when a boxed cake mix can be just as delicious! For the cake portion of this delicious dessert, simply prepare a box of white cake mix according to the directions on the box. In a separate small bowl, add 1/4 cup white sugar and 1 tablespoon of cinnamon. Stir together well then add this to the cake batter and stir well to mix. 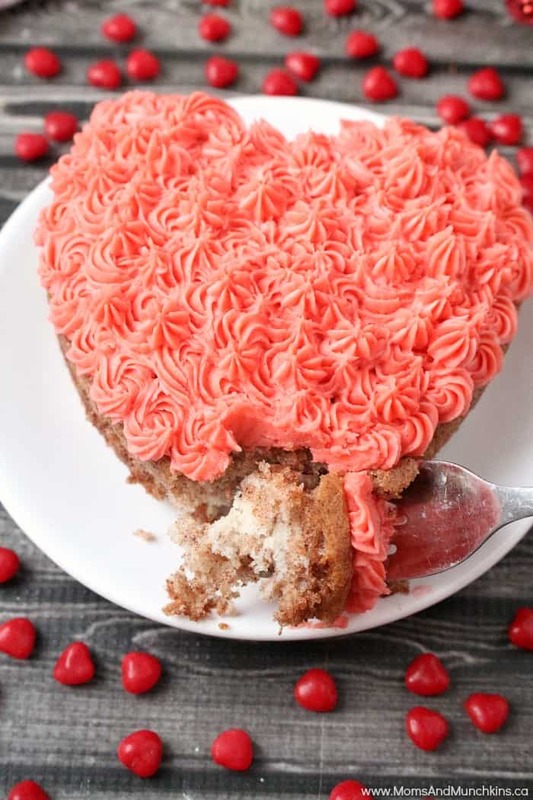 Pour the cake batter into a heart-shaped cake pan or into mini heart pans. Once your baked cake has had a chance to cool, top it with some delicious cinnamon buttercream (recipe below). This delicious cinnamon buttercream is perfect for a Valentine's Day treat. This recipe makes about 3 cups of frosting. In a large bowl, beat butter and half of the icing sugar until light and creamy. Add the heavy cream and cinnamon. Gradually add the remaining icing sugar and beat until smooth. You can add more cream if the mixture is too thick or more icing sugar if the mixture is too runny. For more Valentine’s Day ideas like free printables, party ideas, sweet ideas for a special someone and more, visit our Valentine’s Day page. For more delicious recipe ideas, visit our special Recipe page. We’re always adding new ideas so follow along on Facebook, Twitter, Pinterest and Instagram for the latest updates! Thank you, Helene! It was very delicious! Umm…how much cinnamon in the frosting? Oh geez! I typed “vanilla” when I meant cinnamon. It’s one teaspoon of cinnamon.